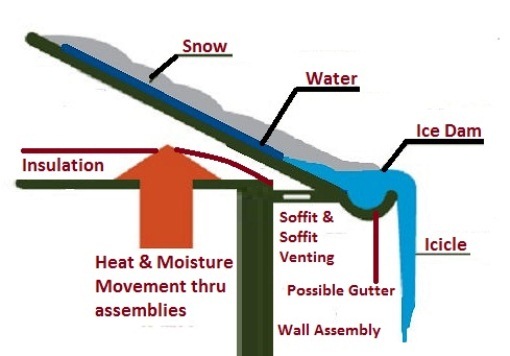 An ice dam is created when melting snow is running down the roof & refreezes before it hits the ground. Eventually as this continues the layer of ice keeps getting larger which can leave water piled up behind it. 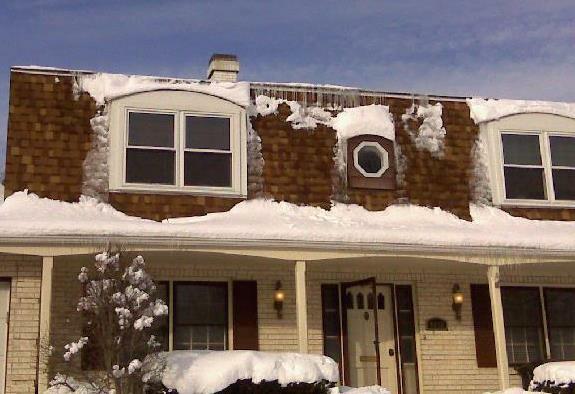 The root cause of this issue is simple & that is your heating dollars flowing into the attic. 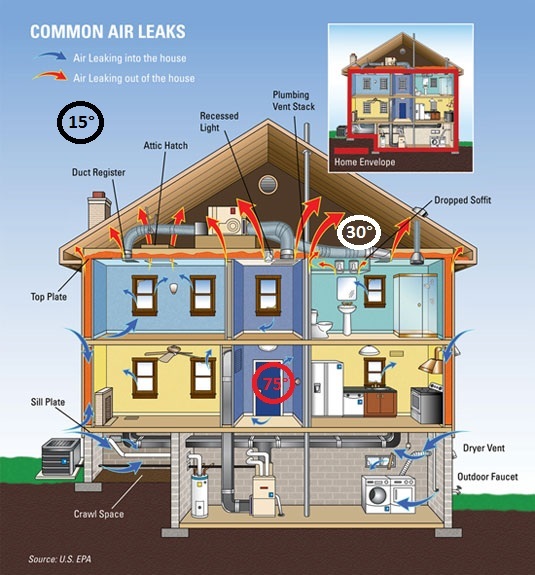 The fix: stop the heat loss which is done by stopping the air leaks first & then insulating the attic properly. 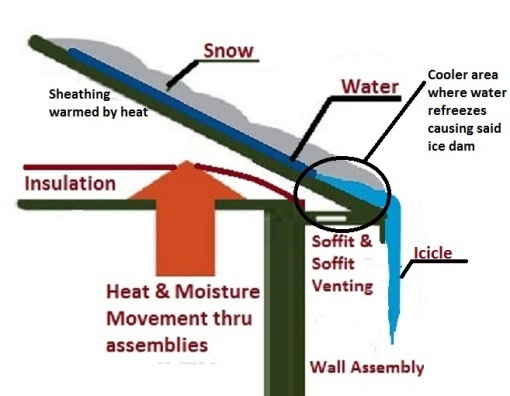 Ah yes the famous wintertime stack effect picture that shows how heat & moisture movement happens during the winter. In this case with the temperatures listed, the sheathing is still cool enough to help prevent the ice dam issue from happening. A better view that shows how this issue happens – in this case it is further exacerbated by the soffit venting which helps cool the area even faster. While many equate this problem as only happening with gutters, that couldn’t be farther from the truth though having them can make it larger or to start easier. Air leakage is the worst culprit out there for allowing unwanted heat loss (assuming you have enough insulation) & moisture gain into an attic. The second biggest offender is bathroom fans that are not run outside, or if they are it is simply dumped out the soffit area where it is pulled right back into the attic assembly. The final culprit /solution is actually you; by keeping the temperatures inside down to a reasonable level, you automatically reduce / slow down the heat loss through the insulation. By keeping the humidity levels down around the 40% or less range, you are minimizing the amount of moisture that can be pulled into the attic – so make sure you run those bath & kitchens fans not only while you are cooking or showering, but long enough afterwards to remove that moisture. First let me forewarn you, just because you see icicles does not mean you have issues as this is pretty common. You see at temps above 20° with the sun shining down it still allows for snow to melt with little to no heat loss inside your attic. As the temperature starts dropping or it hits a shady area, this allows that water to refreeze before it hits the ground causing icicles to grow. Two of the biggest areas for this are on the north side of the house (coldest side) & at valleys. 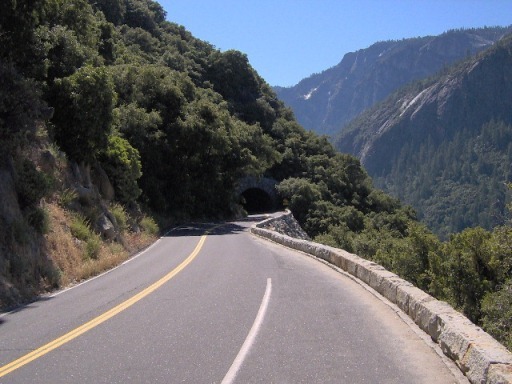 While many love to talk about increasing the ventilation stopping all the issues listed here, you really aren’t as the root issue still exists. Passive ventilation can only remove so much heat or moisture from the attic and is not the end all be all. 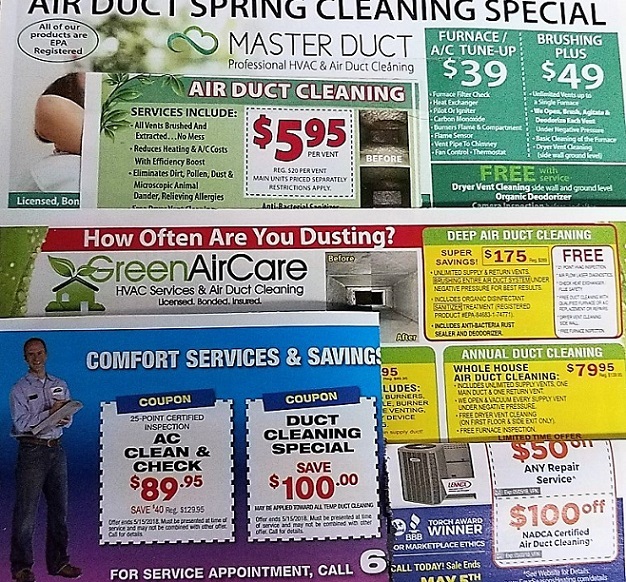 Does this mean that you shouldn’t add ventilation if it is missing or undersized – no, not at all but if you fail to solve the real issue…As for active ventilation strategies – while those work as temporary fixes, some of them can actually make matters worse if you artificially end up pulling more heat or moisture from the house instead of cool dry air from outside. If you have or do add soffit venting, make sure you install baffles & as always keep the insulation away from the sheathing. Now the real large “I want to rip your gutters off” icicles is definitely an issue which also probably means you also have an ice dam issue which this picture shows. The fix is the same as above – stop the heat loss into your attic. 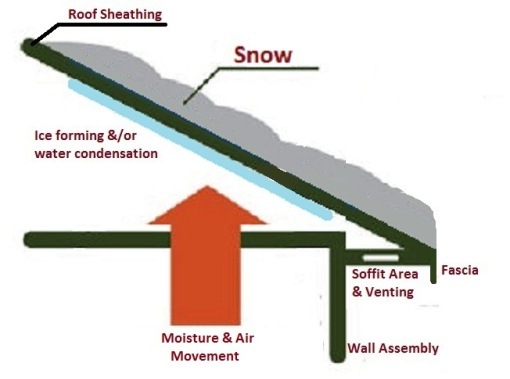 While we left the snow on the roof for this diagram, it really is not a requirement as stated above. The ultimate fix? Got a cape cad, dormer, knee walls, a majorly cut-up roof, or… Go with a hot roof & bring the attic into the conditioned space. Just remember if you wish to go this route with something like cellulose, open cell foam, fiberglass or a mineral wool product (aka air permeable) you must either spray an air impermeable insulation (Closed Cell foam or a tested Open Cell at 4” or more) directly against the sheathing or have it directly attached above the sheathing per the codes to stop condensation issues.IRC 2009 figure 806.4 shows that in Climate Zones 1 – 3 is R5, climate Zone 4 varies from 10 to 15, 5 needs an R20, an additional R5 for each zone above that. 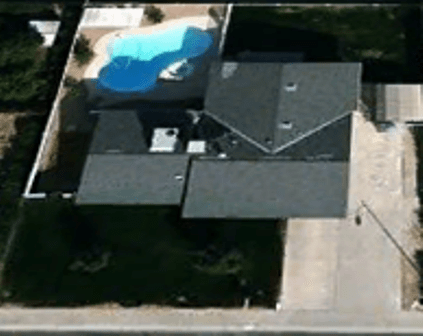 The only exception is for climate zones 2B & 3B with a tile roof. FAQ: Smoke Detectors, Batteries, & DST? FAQ: Does my freezer really need to be kept at 0º?